There are many calendar contenders —but if you need more than the default offerings, probably the reason you haven't got Fantastical yet is the price. It is $50, after all, and if you rarely use your calendar, you have better things to spend the money on. 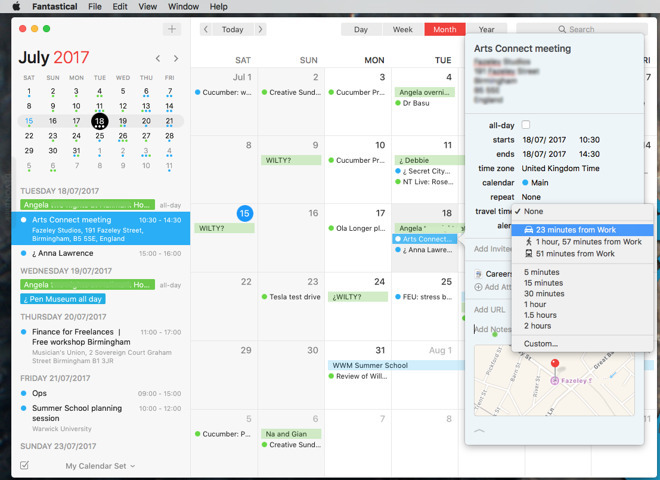 Yet, if you're on the fence or you haven't yet found a calendar that does all you need, the new Fantastical 2.4 for Mac brings features that may clinch the deal for you. None of these new features are revolutionary game-changers, and some of them have been in other calendar apps before. Even when they are catch-up additions, they are significant and well done. Plus, having them with Fantastical's existing features and either Dark or Light design is compelling. Practically, the first and most obvious to detail is that you can now add attachments. Say you have a meeting to go to. You used to put that in your calendar and forget where you'd filed away the agenda's Word document. Now you can add that document directly to your calendar entry in Fantastical - the way you already could in Apple Calendar. 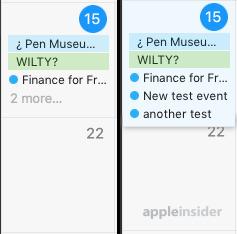 Double click on an event in any Fantastical view and you get a regular information window showing its details plus a small downward-facing arrow at the bottom. Click on that - or press Command-E - and the window expands to show more options. One of them is for adding attachments. It's got an Add Attachment button which is the fastest to use when your agenda or whatever is multiple folders deep somewhere on your hard disk. Otherwise, if you can already see the agenda on your desktop or in an email, drag it over into that Add Attachments section and it's done. So the moment you add the appointment or the moment that the organizer gets around to sending out the agenda or the minutes or anything else, you can pop these documents into your calendar. You can attachment them right where you'll be able to find them again on the day. Except when you can't. Right now this won't work if you're using Google Calendars nor if someone sends you an initiation over Microsoft Exchange. In that case they own the event and it's read-only to anyone else. So you can't add attachments via Fantastical or any other calendar app. This attachments feature is something that you'll either always or never use. If it's a key feature for you, if it's an essential, then it's been one reason to avoid Fantastical and stick with Apple's own Calendar. Strictly speaking, another reason to stick with Apple's one has been its excellent travel time feature. When you've added an event and included a location address, then Apple Calendar keeps an eye on traffic for you. As well as any early alarms you might set for an event, Apple Calendar will pop up a message when it thinks you should leave. It tells you traffic is heavy, traffic is light, and that if you get a move on right now you'll make it. It's timed so that you can read the message, put a coat on, grab your keys and get to the event on time. Now Fantastical has the same feature and in one sense it really is exactly the same. 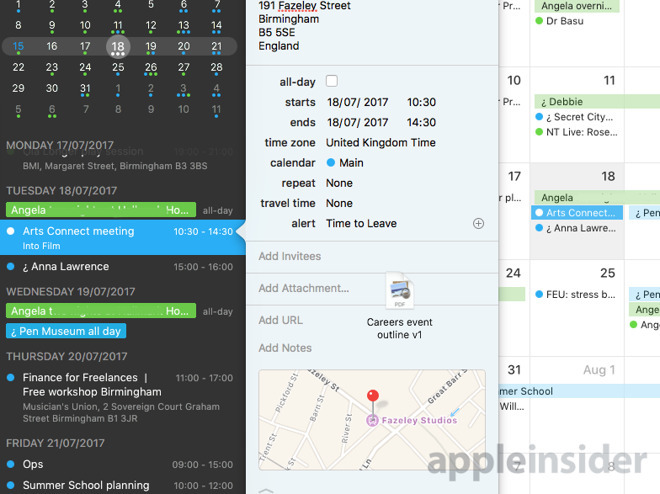 Just as Fantastical and almost every other Mac calendar app really uses Apple's own engine, so Fantastical uses Apple's own travel time feature. 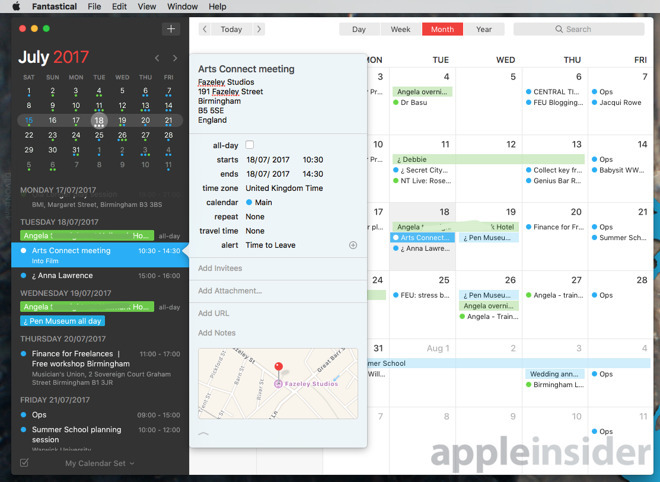 It's a very good feature and Fantastical does it better than Apple Calendar —but you weren't really lacking it before. 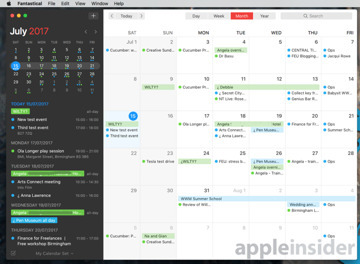 Your Mac already has Apple Calendar and all events from all calendar apps use the same macOS engine. So if you create an event in Fantastical, Apple Calendar knows about it and Apple Calendar would still give you those handy travel time reminders. Consequently at first it seems like having the feature directly in Fantastical is just a small convenience. However, Fantastical gives you more access to it and so has more options than Apple Calendar does. With Fantastical's version, you can say that you're walking instead of driving. Or that you're taking public transport instead of either. You set that and it remembers so it gives you departure alerts at the right time. When you tap on Travel Time and have already entered the location of your event, Fantastical shows you the time it would take you to get there right now by car, by public transport or on foot. Choose one of those and it will remind you of the event in time for you to drive, ride or walk as applicable based on road conditions on the day. You can elect to have it remind you a specific amount of time before the event. So rather than a dynamically changing time that depends on traffic and other delays, you can tell Fantastical to just give you a nudge 5, 15, 30 minutes or more before the event. There's no particular benefit to doing that -it's the same as setting an alarm for 5, 15 or however many minutes before an event the way you've always been able to. However, this form of customization is the only one that Apple Calendar does so this feels more a case of Fantastical inheriting it rather than designing it in. Similarly, Apple Calendar has an Undo feature for changing the last thing you did and Fantastical gets that - but Fantastical 2.4 goes takes it much further. The new version of Fantastical remembers every change you did to any event, not just the last one to the most recent appointment. So if you altered the title, added a new invitee, changed the time, extended the duration and bumped it all back a month, you can Undo back through every one of those. Or you can in this current session. If you first move one meeting back by an hour and then add a dozen new events, each with attachments, you have to Undo back through the new ones before you can Undo that move. If, instead, you quit Fantastical and open it again tomorrow, you can't step back through the changes you made today. 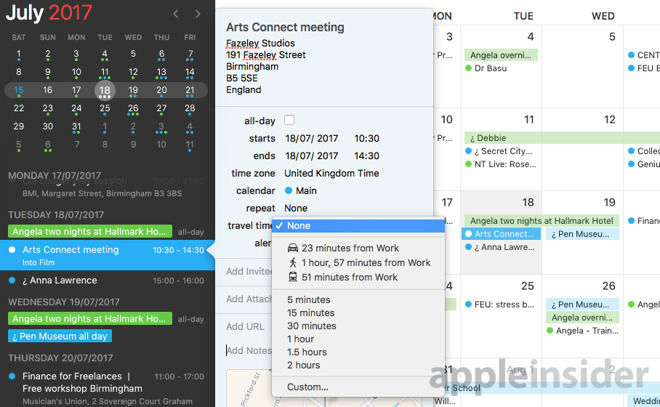 That's still far better than Apple Calendar's single undo feature but it may be a mark of how little we use this that we just had to go check whether BusyCal does it too. It does. Still, on the odd occasion that you need Undo, Fantastical now does it very well. Fantastical 2.4 has also improved how it deals with invitations from people. If they're on Google Calendar, you can accept or reject an invitation as before but now you can also add a message saying how much you're looking forward to it. If your whole company is using Exchange, Fantastical now has more options for responding and also forwarding invitations to other people. What will benefit all users on Exchange, Google or iCloud, though, is a nice little addition to the Month view. Fantastical's Month view is already an excellent example of how smart design can convey a huge amount of information in a small space. However, sometimes it is just too small and you do have too many events. When you've got more appointments on a day than can be comfortably shown, you've had to click and fumble to read more. Click on the More label at the bottom of a busy day, and that day expands out to show you the complete list of events. The extension folds down over the day below like the flap on an Advent calendar and has room to show you all your events on that day. Lastly for version 2.4, sometimes an app has to improve a feature before you realize that feature existed at all. That's what happened with Fantastical and Facebook. We, you and every one of the two billion people on the service have had those updates where it says you've got eight events this week - and you've not heard of any of them. Facebook's eagerness to make you connect and determination to keep you within its walled garden has meant we ignore events. We tell ourselves that we will remember to check if we're free, but we generally don't. However, alongside the stream or the storm of events in your Facebook there has also been a calendar. Hidden away next to Going, Not Going and Maybe there is a button for more options and that's got one for adding to your Facebook calendar. What Fantastical 2.4 has added is a significant improvement. Now when the organizer makes a change to their event on Facebook, it gets pushed out to your Fantastical calendar. That's what new to Facebook events in Fantastical 2.4 and although it's a small improvement, it's changed how we use Facebook events. Still, though, $50 for Fantastical? All of which means that these improvements in Fantastical are the same as the app's previous features: many, many small things that together make this compelling. 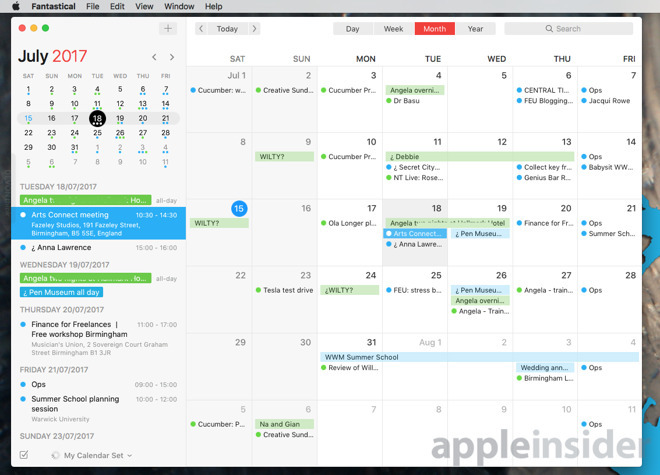 It is the best calendar app for the Mac, despite Apple's own being very good and the similarly-priced BusyCal being excellent. 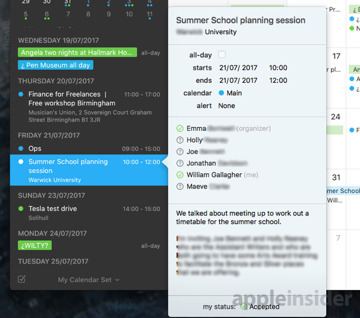 Fantastical 2.4 is sufficiently good that there is no question you would find it useful, an improvement and maybe also just enjoyable. Whether that's worth $50 to you is harder to suss out. It may come to this: if your thinking is that $49.99 is a lot for just a calendar, you don't need this. 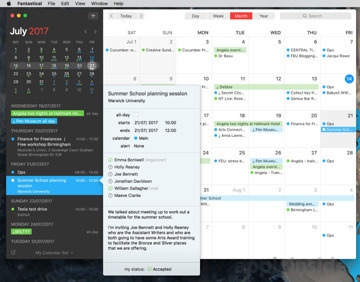 If instead you use calendars so much that your first thought is about these new features and their time-saving value to you, go buy Fantastical 2.4 for Mac. If you've already a user then this update to Fantastical for the Mac is free. Otherwise Fantastical 2.4 costs $49.99. There are also two separate iOS versions for iPad and iPhone. Fantastical 2.8.6 requires iOS 10.0 or higher or macOS 10.11.5 or higher. It costs $4.99 on the iPhone and $9.99 on the iPad.